Hello! Welcome to my blog! It is a blog about astronomy, I hope you will enjoy my posts! And if you have any suggestions about my content or just want to chat with me, you can leave your words by comments or C-box down the right hand side! After the rain pours down from the sky, the stars shine clearer in the night. What is your dream? My dreams of stars are to observe them in different latitude and locations. 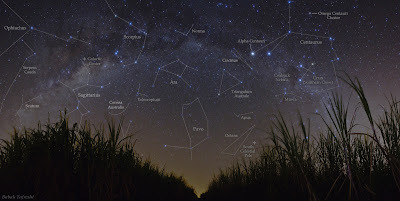 I would like to go to Australia, Brazil, Argentina and Chile, which are located on the Southern Hemisphere, to take a look at night skies, and compare them to Taiwan’s; I also want to go to Central America and Africa, which is located around the equator, and embrace the southern and northern constellations together. "A Starry Night in Brazil" from "Astronomy Picture of the Day"
And, I want to lie on the grass, and enjoy the glory of the mythology heroes which are now on the night sky; I would like to sit on the beach, and listen to the wave sing with the stars; I want to walk on the desert, and appreciate the silent night with the starlight; I would like to climb to the mountaintop (especially very high mountains which are above clouds), to catch and collect the whole clear night sky… Oh that will be so wonderful for me to have all those beauteous experiences together!!!!! An Astronomy Lover!=) Welcome to my blog! Who comes to my blog?